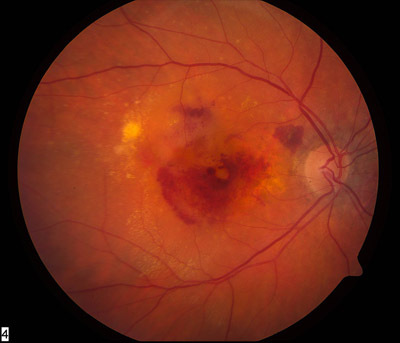 Age-related Macular Degeneration is a progressive degenerative disease of the macula that results in decreased central vision. 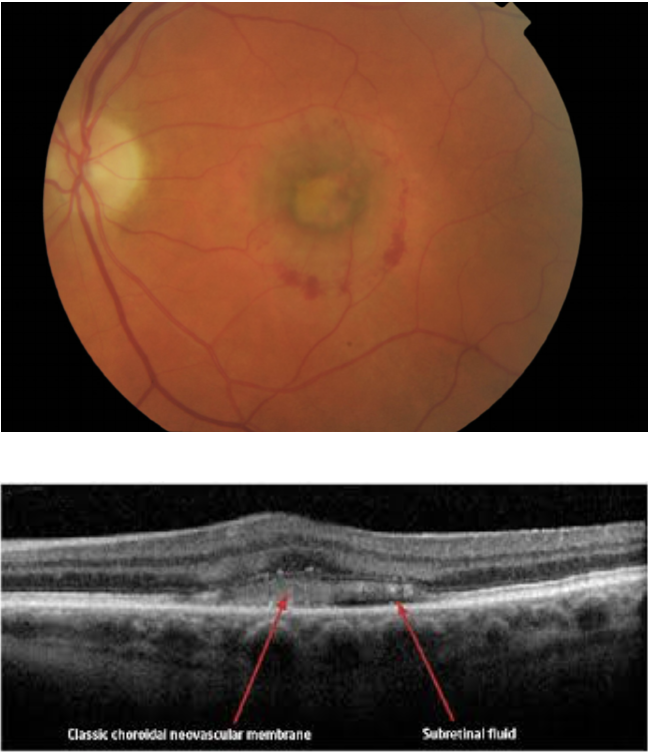 Generally classified into two types: (1) nonexudative, or “dry” ARMD, characterized by drusen and pigmentary changes (90%) and (2) exudative, or “wet”, characterized by choroidal neovascularization (new blood vessel growth) and eventually atrophy and scarring (10%). 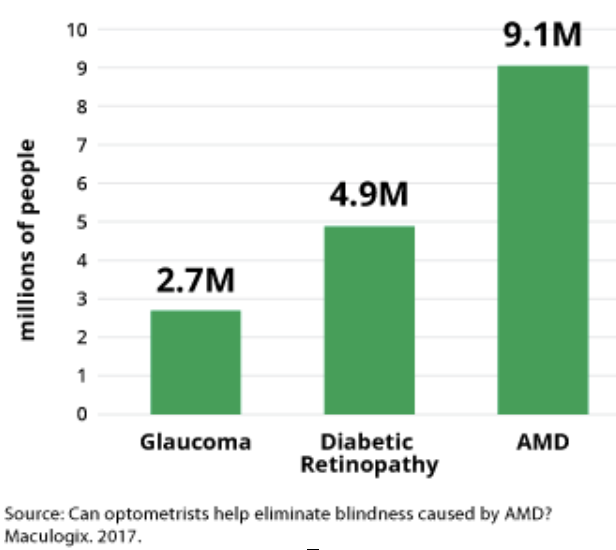 Macular degeneration is the leading cause of vision loss among older Americans, and due to the aging of the U.S. population, the number of people affected by AMD is expected to increase significantly in the years ahead. Advanced age: Although AMD may occur earlier, studies indicate that people over age 60 are at greater risk than those in younger age groups. For instance, a large study found that people in middle age have about a 2% risk of getting AMD, but this risk increased to nearly 30 percent in those over age 75. Race: Whites are much more likely to lose vision from age-related macular degeneration than are African-Americans. A gene variant that regulates inflammation: While not all types of macular degeneration are hereditary, certain genes have been strongly associated with a person’s risk of AMD, and genetic predisposition may account for half the cases of age-related macular degeneration in this country. Family history: Studies indicate that your chances of developing age-related macular degeneration are three to four times higher if you have a parent, child, or sibling with macular degeneration. Smoking: Current smokers have a two-to-three times higher risk for developing age-related macular degeneration than people have who never smoked. Artificial fats: Usually labeled “partially-hydrogenated vegetable oils,” these artificial fats are pervasive in foods and particularly in low-fat bakery goods. Low-fat foods are good options if they’ve achieved their low-fat status through a process that physically removes the fat, as in skim milk or low-fat cottage cheese. Low-fat bakery goods are different, however. If you remove all or half the fat from a cake recipe, it won’t turn into a cake; thus, when cakes and bakery goods are labeled low-fat or no-fat, it means they contain artificial fats, or laboratory-produced chemicals. These chemicals are not food and our bodies can’t metabolize them. 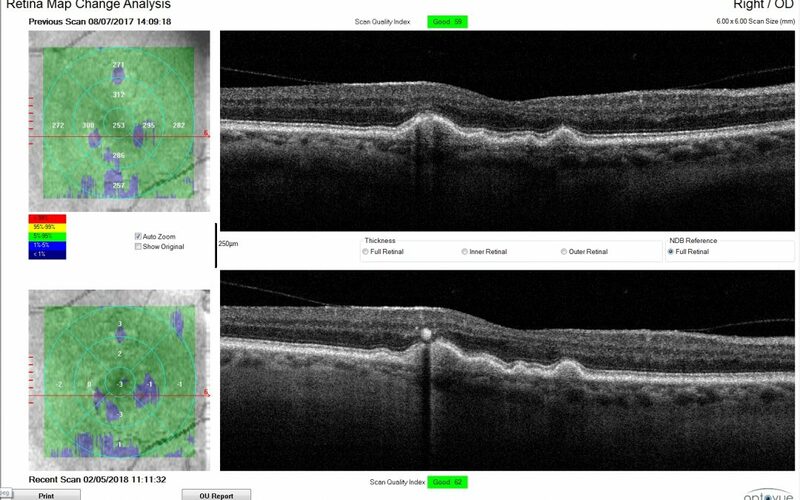 Sunlight: It is the blue wavelengths from the sun that damage the macula, not the ultraviolet (UV) rays. Artificial Lighting and the Blue Light Hazard from Prevent Blindness for more information: http://lowvision.preventblindness.org/daily-living-2/artificial-lighting-and-the-blue-light-hazard/#blue. [Blue light exposure may increase the risk of macular degeneration. The fact that blue light penetrates all the way to the retina (the inner lining of the back of the eye) is important, because laboratory studies have shown that too much exposure to blue light can damage light-sensitive cells in the retina. This causes changes that resemble those of macular degeneration, which can lead to permanent vision loss. A diet high in processed, packaged foods and low in fresh vegetables: Vegetable oils are added in the packaging process. These oils are rich in omega-6 fatty acids, which promote inflammation. 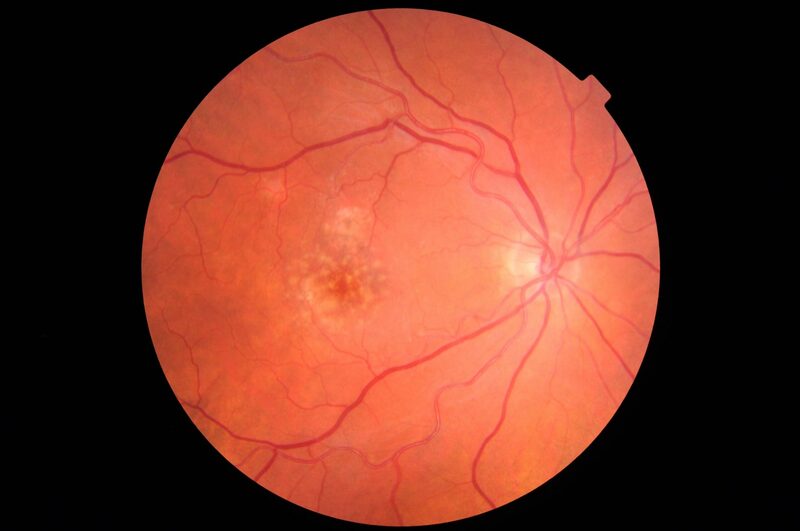 Uncontrolled hypertension and high cholesterol: Research by the National Eye Institute indicates that persons with hypertension are 1.5 times more likely to develop wet macular degeneration than persons without hypertension. 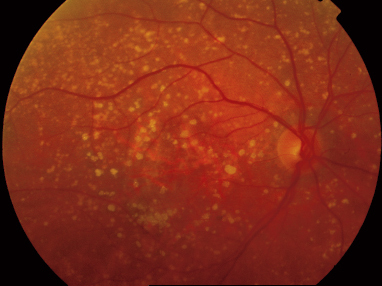 Obesity: Being overweight doubles the risk of developing advanced macular degeneration. 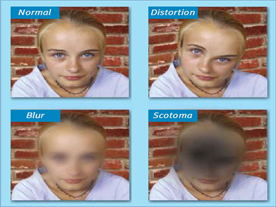 Initially patients are asymptomatic or possibly mildly decreased vision and metamorphopisa (waviness or distortions in central vision). Advanced forms may cause central blind spots. Examine every 6 months. 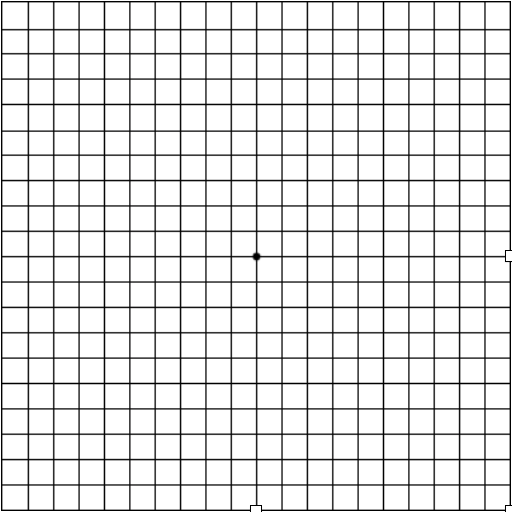 Examine sooner if patient has a change in vision or change in Amsler grid. What are lutein and zeaxanthin? 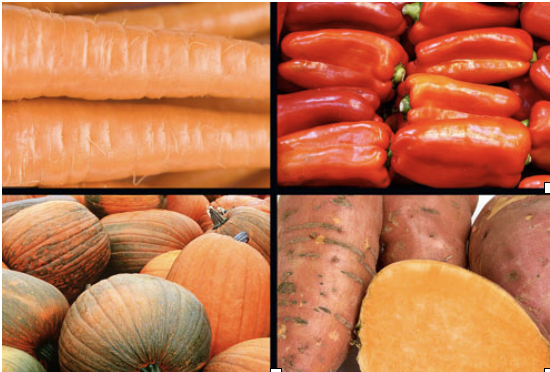 Lutein and zeaxanthin, along with beta-carotene, belong to a family of organic pigments known as carotenoids. Carotenoids are made by plants and are especially enriched in green leafy vegetables. They can be stored in animal tissues and are found at relatively low levels in animal food products. In the body, it is used to make Vitamin A, which is required by the retina to detect light and convert it into electrical signals. Responsible for the yellow color of corn, marigolds, egg yolks and animal fat. Found in the human retina and lens, where they may act as natural antioxidants and help absorb damaging, high-energy blue and ultraviolet light. Note: Previous treatment used to be only lasers. Once CNV has developed in one eye, whether there is a visual loss or not, the other eye is at relatively high risk for the same change. 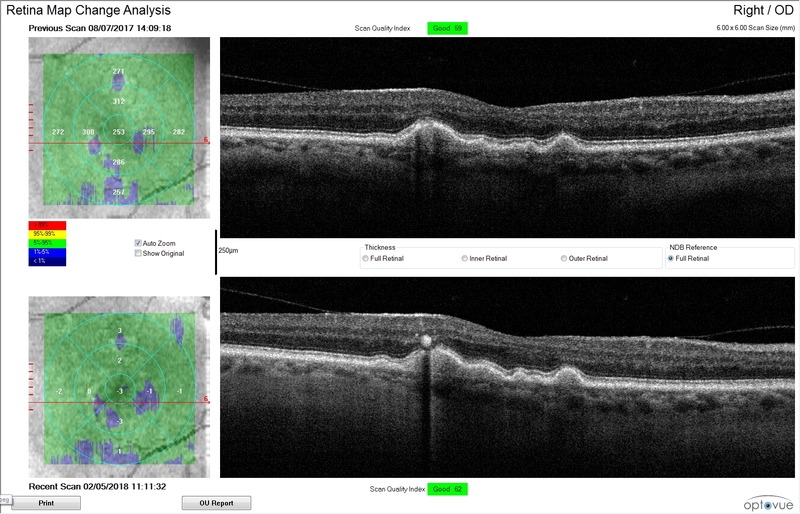 When all four risk factors—more than five drusen, large drusen, pigmental clumping, and systemic hypertension—are present, the five-year risk of CNV in the second eye is 87%, whereas if none of these risk factors are present, the risk is 7% (3). Uptown Eyes has researched vitamin supplementation in order to offer well-made, naturally-sourced, and convenient products. This link will take you to our Eye Formula. There are many other beneficial supplements available there as well, notably Omega 3 with DHA/EPA. check out our Eye Formula here!